I’m in the Pacific Northwest again. This trip it is not so much about coffee (it’s always about coffee) but more about my pilgrimage for a little soul feeding. Five hours on a plane is a huge challenge for me – either I want to chew my leg off and escape OR I can settle in and take the space to do a little introspection. I settled in. I wanted to be able to share enough coffee stuff so I could blog about it here, but I love the Pacific Northwest so much that most of me just wants to share it with everybody I know. My first trip to Seattle was back in December of 1994. My job back then was not about coffee. I was a co-founder in a company, in Pittsburgh, that contracted with pharmaceutical companies to perform clinical trials. I managed, operated and formed partnerships with hospitals/physicians around the country to do the work – Seattle was our first satellite location. My first trip to Seattle was about lots of long hours at the office and torrential rain – I loved it! At first, I commuted to Seattle on a weekly basis. I couldn’t immerse myself enough in the dramatic natural beauty of the Pacific Northwest and what I called the “culture”of the Pacific Northwest. To me, a regular commuter/visitor, the neighborhoods (Capital Hill, Belltown, Queen Ann, U District, Downtown) were so stunningly vibrant. The dramatic beauty was a given, but what else made “it” so incredibly special? I was sitting outside an espresso bar, near my office, on Broadway in Seattle, and it hit me – within feet there were coffeehouses – a coffeehouse that attracted professionals, bike messengers, grunge music, artists, activists and politicos. There was a huge culture and community that coffee helped create. Back in Pittsburgh, 15 years ago, that culture didn’t exist. We had La Prima in the Strip and the Beehive on the Southside. All I know there was a huge void. Currently, I am staying in Seattle, then traveling south for a quick minute to Olympia, then to magical place where the Columbia River merges with the Pacific Ocean – a place that is entrenched with deep historical significance – the Lewis and Clark Expedition – a time where incredibly driven men and one woman forged though unbearable conditions to prove there was a passage from the East (Pittsburgh, PA) to the West (Seaview, WA),via water, to incredible opportunities of trade and commerce. And for me, the expedition to the Northwest, 15 years ago, has brought me to “here” – Tazza D’Oro – my passion for coffee, the culture of coffee and the community of coffee. So for this trip, I thought it would be great to re-trace my steps and share with you what brought me to “here” – it’s always about the coffee. Good stuff tomorrow. And a few pics from today – FYI, February in the Northwest still brings lots of rain, but mild temps bring Spring. Today was so freaking beautiful! 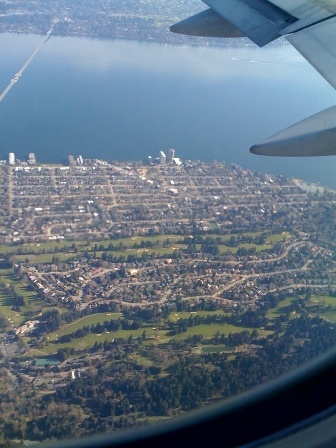 Thought you would like to see a little green and a view from the plane overlooking Lake Washington before landing. Had coffee today to take the edge off the caffeine headaches, but tomorrow will be about “real” coffee. 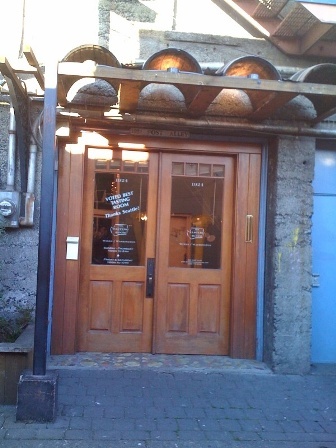 This afternoon was about getting our palates primed with a visit to the Tasting Room located on Post Alley, just up the hill from the Pike Place Market. I love this place and space. 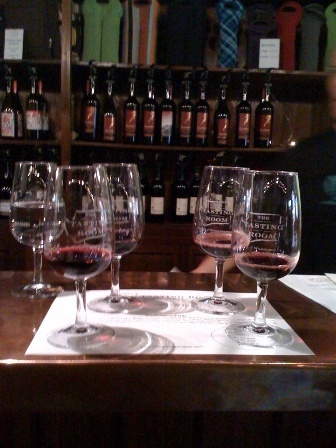 We tasted wines from the state of Washington – single grape. 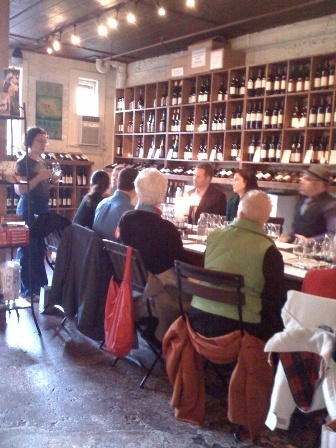 The Tasting Room is a wine co-op for local vineyards – rad, rad, rad!